Nicotine gum releases nicotine into your mouth when you chew it. The nicotine is absorbed into the bloodstream through the vessels in your mouth. Nicotine withdrawal should get better within 15 minutes. The gum comes in 2 mg and 4 mg doses. Nicotine gum can be purchased at a pharmacy without a prescription. Don’t eat or drink 15 minutes before using the gum. This includes chewing gum and candy. Coffee, tea, soft drinks, alcohol, or citrus juices may affect how the nicotine enters your body. Side effects include a sore mouth, jaw ache, hiccups, and stomach ache. 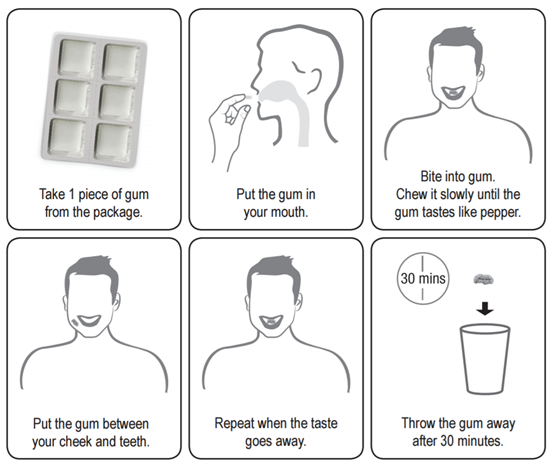 This could be technique-related, please read over how to use the gum again.